"Eight years after joining ESOC, it was time for the Brown family (or some of it) to attend their first ever ESOC Burns Supper. The date had fallen within half-term so with a break from chauffeuring around to Brownies, swimming, ballet and Explorers there was no excuse. We gathered at the Fawthrops' in Marchmont ready for the run. The weather was dry but cold – but Ben still decided he only needed shorts and t-shirt. Ewart issued instructions and we set off to tackle the courses. Basically the control sites were all post boxes, but if you visited certain groups you could gain bonus points. Rachel and I worked as a team on the 40 minute Score (as an under 16 she needed to be accompanied) and Ben tackled the 60 minute. Most opted for the shorter course, with only 4 competing in the long. For Rachel it was a gentle jog as I panted along behind trying desperately to keep up – my only contribution to the team was as secretary as I had to write down the numbers from the post boxes as she shouted them out to me. It was fun running around dodging pedestrians, cars, bikes and meeting other runners on the way. It was then a race back to the Fawthrops' to make it within the time limits, as there was a hefty penalty of 20 points per minute late. Some did manage minus points – but no names will be given as they had enjoyed a nice walk. Ben managed to come back with a bleeding toe as he had run straight into a metal pillar. However this obviously didn’t slow him down much as he won the long course, with Mark Rowe second. However it should be noted that Mark visited more post boxes than Ben, but wrongly noted down the required number at 3 of them (Adam – you need to get your dad to work on his number skills!). Rachel and I were 1st on the short course, with Margaret Dalgleish second. Once the runners had returned to join the cooks and non-runners, the festivities began. The haggis was fiddled in by Bill Gauld and was addressed by Peter Coutts. The table was suddenly laden with huge dishes of haggis, neeps and tatties – all prepared by the Monday Running Ladies. As hungry orienteers descended on the feast – the dishes were all scraped clean. The table was then magically replenished with an amazing display of puddings, and most had managed to leave enough room to enjoy the delicious spread. And they all said "Aye"
So it's "Heres to the lads and the lassies"
In total 42 enjoyed the fun – with an age range of 71 years ranging from 14 to 85 (nearly - Bill G will be 85 next week). 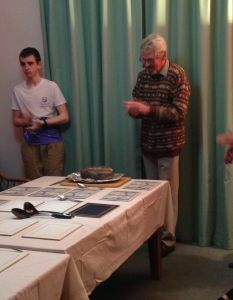 Thanks to Ewart and Mike for great courses, the Fawthrops for hosting and everyone who contributed to making the meal. A great night – fun orienteering, great food and good craic! Hopefully it won’t be another 8 years before we are able to attend again." Photos below from Crawford Lindsay and Margaret Dalgleish. There are a few photos from this social on Facebook. "The planning process was centred around a club social and the need to accommodate limited numbers and costs. Being a social it was important to offer courses that would give a range of club members' abilities a challenging outing without detracting from the main event, the Burns meal. Ewart and I decided to opt for a postbox score as this involved minimal planning and easy administration. No tapes, SI or visiting sites were required as it would be unlikely that anybody would have removed the feature! The long and short options were intended to cover the full range of club ability and they were effectively both the same event with a smaller area and fewer postboxes on the short score. We selected an area that involved the minimum amount of major road crossings. We needed a format that involved some strategy as the navigation was simplistic. The long score therefore had 5 groups of seven postboxes and the short score three groups of seven postboxes. The ideal was that nobody could get them all on either course. Competitors will have noticed that groups could not be taken in a logical sequence as they were scattered to encourage strategy. An easy group around the base camp was planned on both courses though not a lot of people cottoned on to that. We offered bonus points to anybody getting all seven in any group to encourage competitors to think about the order they took them in rather than who could visit the most sites. Strategy in other words. This we hoped worked out well in practice though the OPEN map was difficult to read for some in night vision. Hopefully most people enjoyed their outing and we were glad the weather smiled on us, as having to write down something at a control is never the preferred option."